Intense heat has arrived in South Georgia this week with daily high temperatures in the upper 90’s . This occurs as nuts are sizing and the water demand for pecan trees begins to increase. Up to June pecan trees benefit from irrigation but only need a fraction of the amount they require as the crop begins to develop. This demand will continue to increase through the nut sizing period and peaks during the kernel-filling process in August and September. 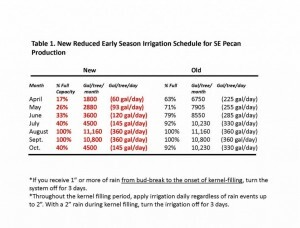 As a result, the irrigation schedule for pecan production should reflect the tree’s demand throughout the growing season. 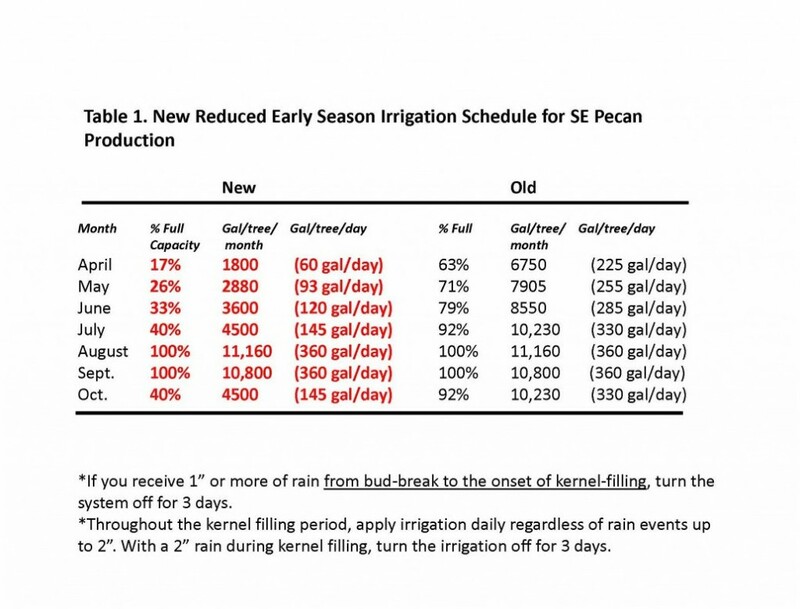 Our recommended irrigation schedule for mature pecan trees (age at which an economically significant crop can be harvested—usually 8-10 yrs and beyond) is found below. Your maximum capacity to be applied in August and September is 3600-4000 gallons per acre per day within a 12 hour period. Percentages shown in the table above represent the percentage of this maximum capacity for each month. We are often asked, “Doesn’t a 60 year old orchard need more water than a 10 year old orchard?”. The general answer is no. There is probably some wiggle room in there for certain situations because many factors play into an orchard’s water demand, including the number of trees per acre, crop load, cultivar, nut size, hedging, etc. For example, while an individual 10 year old tree’s water demand may not be as great as that for a 60 year old tree, there are fewer trees per acre in an orchard full of 60 year old trees (if the orchard has been managed correctly), thus the water requirements per acre are about the same. Hedging may change this somewhat and we are working to try and determine any differences in water demand for hedged vs. non-hedged trees under our conditions as this practice becomes more common in the Southeast. For now, research has shown that the schedule above works for all bearing pecan trees grown under our conditions. In addition, it is a 38% reduction in the amount of irrigation water applied over the previously recommended schedule, with all the savings coming from April-July. Many are concerned that applying less water than we had applied previously in June and July would limit nut size. This is a very important question because nut size rules the pecan market at this time. But, our work over a 3 year study, including 2 years with very dry weather during these two months has shown no loss in nut size, yield, or quality for the above schedule compared to the old schedule. In fact, nut size was even a little larger for the reduced schedule. The requirement for June is a little more than 1300 gal per acre per day. In July the requirement increases to 1600 gal per acre per day. While this does represent less water than the previous schedule, it is still no small amount of water and is quite enough to size the nuts. Previous: Southern Corn Rust Found in Georgia. Now What?